SOME of the UK’s most prestigious venues are giving corporate clients a good reason to perk up this new year. Sodexo Prestige Venues & Events is the catering partner at museums, sports stadia and visitor attractions across England and Scotland. And from January through to 31 March 2017, it is offering business bookers a variety of complimentary Prestige Perks to add to their daily delegate package. In addition to catering treats and complimentary breakout rooms, participating venues are offering special perks that are totally unique to their specific venues. Tours, museum entry and afternoon tea are just some of the treats in store at 14 of the UK’s most exciting and prestigious venues, including the iconic IWM London, historic Knebworth House, Hertfordshire, Newcastle United’s St James’ Park and Royal Botanic Garden Edinburgh. Huddersfield’s John Smith’s Stadium, Everton FC’s Goodison Park and Yorkshire’s Headingley Carnegie Stadium are each offering tours, as are Aberdeen FC’s Pittodrie Stadium, Hamilton Park Racecourse and The National Stadium Windsor Park, Belfast. Those attending events at Brighton’s Amex Stadium will be able to pose for a complimentary pitchside photograph, while bookers choosing to hold their event at St James’ Park, or at Knebworth, can opt to treat day delegates to afternoon tea, prepared by Sodexo’s chefs. Scotland’s Hampden Park is offering a tour of the Scottish Football Museum and Hall of Fame, while Perth Racecourse is giving away two complimentary race day tickets for 2017 as its Prestige Perk and London’s The Crystal is offering free access to the Crystal Exhibition at Royal Victoria Dock. Bookers of events at the Apex and Athenaeum, Bury St Edmunds, can opt to add a tour of the Moyse’s Hall Museum - which dates to 1180 and charts the social history of the area - while delegates at the Royal Botanic Garden Edinburgh can meet the venue’s market gardeners and learn about the produce it grows exclusively for its restaurants. Meanwhile, delegates at IWM London can incorporate a mini tour of the venue, which provides a fascinating insight into British military history, with full-size exhibits and interactive displays. In addition, delegates at each venue will also enjoy complimentary mid-morning or afternoon tea and cakes, a break out room and bacon rolls and fruit on arrival. 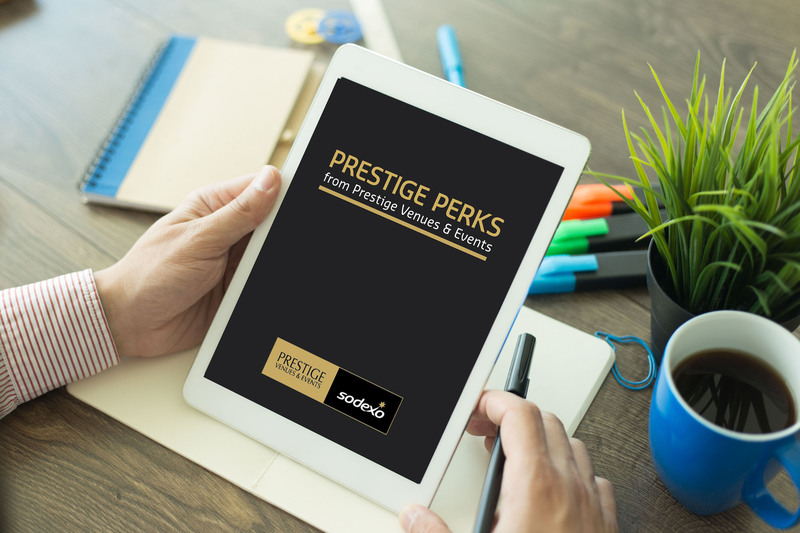 For full details of the Prestige Perks on offer at Sodexo Prestige Venues & Events venues, call the central enquiry hub on 0845 6055 699, email Venues&Events.Prestige.UK@Sodexo.com or visit www.prestigevenuesandevents.sodexo.com.